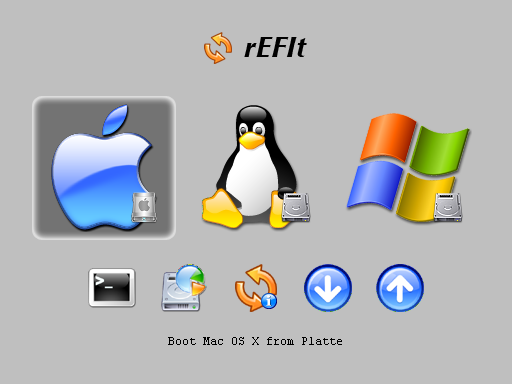 If you’re looking for a solution to triple boot Mac OS X with Linux and Windows without using Boot Camp, you can do this using a third party boot menu called rEFIt (get it? re-EFI-it? rEFIt?? Alrighty then). rEFIt works very well and, upon boot, you’ll discover a nice menu like the above screenshot on each system start where you can select the operating system of your choice to boot into. If you’re already familiar with multi-OS setups, partitioning, and the like, you probably won’t need a walkthrough since the setup is pretty straightforward to those who have experience in dual/triple boot environments. If you’re new to the topic though and would like some more assistance in setting up a triple boot OS environment, LifeHacker has a write-up although it’s sort of just stating the obvious: install rEFIt, partition drives, install OS’s, and of course the rEFIt documentation is another great resource. Check into it and let us know if you like this approach, of if you’d prefer another boot loader, or Boot Camp, or whatever else you use for such a solution. Triple booters, what do you use? can rEFIt boot a system from an external drive as well?